The Counseling Center is offering a number of group therapy options for students this semester. Group therapy is a unique and effective way for students to form connections, practice communication and experience healthy relationship patterns. Groups are offered Monday through Friday and are open to full-time Syracuse University students. For the fall semester, there are nine group offerings within the Counseling Center, including one new group, Students of Color: Releasing the Invisible Weight. This group offers students of color a safe space to process the challenges of navigating the world, on campus and beyond. 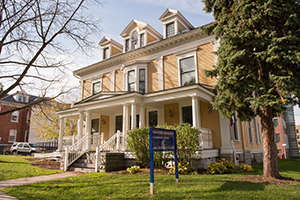 To join a group, students must first make an initial consultation appointment with a therapist by contacting the Counseling Center at 315.443.4715. Additional details about group therapy and frequently asked questions are available on the Counseling Center’s Group Therapy webpage. The goal of this group is to develop understanding and acceptance of the emotional impact of depression and then develop the skills and insight to positively react to those emotions. The skills taught in this group can both reduce the size of your emotional waves and help you keep your balance when your emotions overwhelm you. This group provides members with an opportunity to discuss a wide range of topics, including definitions of masculinity, gender roles and gender definitions, relationships, friendships, family of origin and substance use. The Options Education Group focuses on harm reduction, decision making and the physiological impact of substance use. This group is focused on understanding your drug and alcohol use as part of the pre-contemplative and contemplative stages of change. This group is for female survivors of sexual assault to share their experiences and feelings in an accepting environment. This group offer students of color a safe space to process the challenges of navigating the world and connect with others with similar experiences and feelings. This group is for students who are experiencing symptoms of anxiety and difficulty with stress management. This group offers an opportunity to relate to others who are experiencing similar concerns.